Davies Orthodontics has a strong community presence. We have partnered with the Waukesha Park, Recreation, and Forestry to be the presenting sponsor for all soccer and baseball programs and We also promote and contribute to many other local groups and charities. We have been a major sponsor of: Project Graduation, Waukesha Catholic School System, Kettle Moraine Education Foundation, Relay for Life (American Cancer Society), Wales Park and Recreation soccer and baseball, Oconomowoc Park and Recreation Tee Ball, Kettle Moraine High school Drama, DECA, Music programs, Waukesha North, South, and West Band Boosters, KM Share the Field, Waukesha Tennis Association Raise the Nets, Christmas in Wales , Elementary Schools PTO’s to name a few. 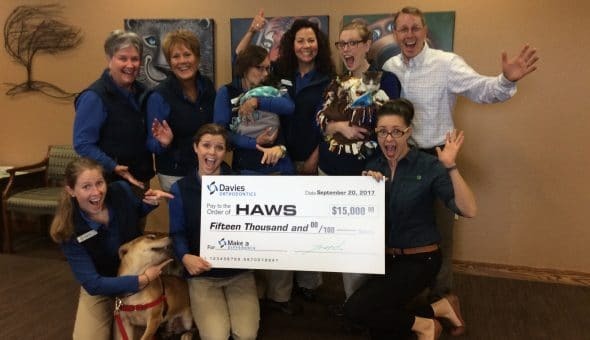 Our main partner in the community is the Humane Animal Welfare Society (H.A.W.S.)! Patients are able to pledge their Wooden Nickels to HAWS(Refer to our Wooden Nickel Program to find out how to earn them.) No donation is too big or too small; Dr. Davies turns the nickels into cash for the animals! The wonderful folks at H.A.W.S. help us figure out where your donations are needed most. So far our patients have donated over $75,000.00! Our goal isn’t just to help our patients, but also our entire community! To learn more about our involvement in H.A.W.S. and our Wooden Nickel Program, call us today at (262) 542-9151. With offices conveniently located in Waukesha and Oconomowoc, WI, we proudly serve families throughout all of our surrounding communities.